We build the most extensive line of C. M. M. Calibration equipment in the industry. 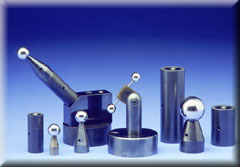 We have calibration artifacts for the smallest and the largest C. M. M. machines. Bal-tec artifacts are capable of accurately calibrating submicron laboratory machines to shop floor machines. Mini Ball Bar (Dumbbell) - Small machines. Extensions - For Calibration sphere. Archival - The ultimate in long term accuracy. Giant Ball Bar - 48 inches Ball Bar ( Dumbbell), all Invar®. Two Ball Kinematic Coupling - Perfect location -used with ultra precise Ball Bar (Dumbbell).